This walk: 2013-5-8. Whitchurch Down, Shorts Down, Plaster Down, Brentor Church, milestone, box well, liverwort, King Alfred's Cakes fungus, ramsons, wild garlic, slotted gate post, hollow-way lane, quartz, foal, Holland Villa, Pu Tor, Great Sortridge Mine, vista of tors, "TA" on a stone. Link to Google Satellite view of the area - the car park is half-way along the image (left-to-right) and about one-quarter the way down from the top edge. The 'pimple' is a three-sided structure over a water reservoir. Zoomed view to Brentor Church. "13 MILES TO PLYMo" - on a 45° slant. Liverwort floating on the water, possibly Pellia epiphylla. Also: Wikipedia link. King Alfred's Cake fungus (this link shows photos of the top of the fungus), scientific name - Daldinia concentrica. This photograph shows the base of the fungus where where it was attached to a dead branch. Near the well, steps down to the stream for washing. Close-up of a ramsons flower. Continuing up the hollow-way lane, believed 10th Century. Zoomed view to Holland Villa. Zoomed view to Pu Tor. Onto the edge of Plaster Down ..... the barn is believed to have been a part of Plaster Down or Great Sortridge Mine ..... at one time included in the Sortridge Consuls sett ('sett' being a spread of land for mining or working for minerals or rock). Tree from the previous photograph, being taken over by ivy that has converted from the simple climbing form into the spreading, arboreal form. Milestone as seen previously but saying 12 miles to Plymouth, at SX 51647 72368. Vista of distant tors. Click on the image to see a much larger version. The Grimstone and Sortridge leat, taking water from the River Walkham (below Roos Tor and Great Mis Tor) to the old manors of Grimstone (SX 5144 7066, 0.75 km north of Horrabridge) and Sortridge (SX 5061 7105, 1 km south-east of Grenofen). Zoomed view to Pew Tor. Not a "TA" stone on the old track between Tavistock and Ashburton, but what is it - located at SX 51367 73363? Something to do with Tavistock? The plaque marks this young tree - it bore oak apples so presumably it is an oak of some description. Very tall gorse, about 10 feet or so? Marking the highest point on Whitchurch Down, at 200 metres (656 feet). Memorial to Pippa Langston: there is a room in her name at Cornwall House, Exeter University. Foundations of a probable WW2 construction when armed forces were stationed in the area prior to the invasion of Europe. 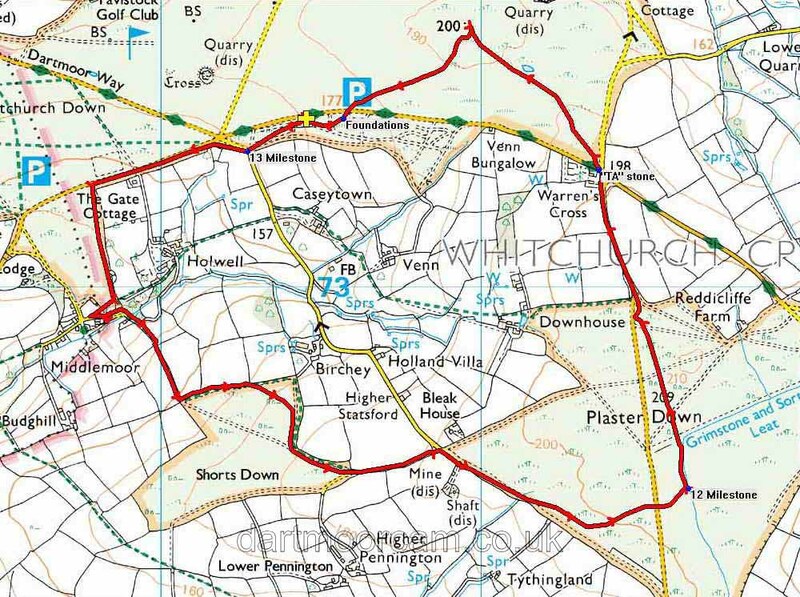 This walk was reached from Tavistock by driving out past Whitchurch church and the Tavistock Inn onto Whitchurch Down, parking at the location marked by the yellow cross on the map. Distance - 6.25 km / 3.88 miles.